This exhibition coincides with the publication of my monograph MARY CHOMENKO HINCKLEY: MATERIAL EVOLUTION that spans 40 years of artistically resolving the perceived conflict between humans and the rest of creation. This new work continues to explore deconstruction of an image, the art making process analogous to travel and exploration and the conflict of wildlife and humans coexisting in our built world. The Golden Winged Warbler and Scarlet Tanager are separated into three stages of being. First a solitary portrait, then the deconstructed bird in the form of geometric ellipses made with a sampling of the bird’s colors and finally the integration of the bird and its deconstructed self. The pieces are about seeing and then seeing more deeply. We think the bird is yellow, grey and black but upon closer inspection it is a hundred colors. The cloud silkscreens on glass are paired with abstract clouds. The elements of clouds, the myriad and subtle colors and soft billowy layers are the antithesis of the cloud in the form of lines, grids, and geometry. The cloud image is deconstructed and reconfigured as an object with similar colors and layers. The travel photos are about discovery. Travel is akin to making art. There is an itinerary for the journey, along with preconceptions and information. Once the journey begins, the revelations and discoveries begin. I record with my camera and notes, unexpected findings, cultural, ironic, humorous and beautiful. Similar to the process of art making, I trust experience and intuition to begin a piece and then remain open to the process and relationships unfolding. Once that happens, I trust the process to reveal what that work will be. For me, the exhilaration in art making is this process of engagement and discovery. The coyote series makes connections between nature, culture, and place. In 1992, given free reign for a commission in Old Town Pasadena, I chose to place a local vermin, a coyote, next to an IBM printer box; both cast in bronze, wildlife and culture are side by side, each taking a place on the pedestrian walkway. I revisited the idea of the coyote in 2015 by casting it in bright colored resin and in bronze with precious gold and nickel patinas. I am asking the viewer to reconsider this wild animal. Today, in Portland these unpredictable creatures abound. Like my coyotes, they are poised and waiting; who is the interloper and who belongs? As a first generation American, I identify with the coyote as a survivor. I lived the struggle with my immigrant parents who after WWII emigrated from Ukraine to settle in the US. I admired their tenacious work ethic, gratitude and desire to fit in and succeed. Who is the interloper and who belongs? I see art as a way of expressing humanity and to have a voice where perhaps none is given. It is a way to make my observation and experience count, be shared and create connection. Meaning and materials are closely linked in my work. A coyote bust cast in clear pink resin offers a different meaning than the same bust in a mirror-finish, nickel-plated bronze. The first summons fragility, memory, spirit and the temporary state of nature and wildlife in our increasing urban density and expansion. The nickel bust portrays a determined, fierce survivor, a challenger; yet it is precious because of the gleaming reflective surface. It is a trophy, a beautiful representation of nature in a cultural context. The life-sized bronze coyote cast in the 90’s, gives way to fanciful colored resin coyotes that may indicate the future of wildlife; are they decorative icons? Civilization’s effect on Nature is evident in sculptures that pit animals and manmade artifacts against each other. A bear confronts the column. The object dwarfs the animal. Civilization dominates the wild. The coyote is a fascinating survivor. It is one of the largest wild animals to survive in our urban environments. How much of the wild animal spirit inhabits humans? Do we look for traces of the wild animal in ourselves? Is that desire? Ambition? Passion? I was commissioned to do a site-specific sculpture in Old Town Pasadena. I chose to make a bronze coyote and a bronze box that I cast from an IBM printer. The coyote and box stand side by side, they coexist. I wish the passerby to be surprised, not expecting this beautiful pest and predator on the walkway. I use repetition to explore an idea. In various colors and materials, different realities are portrayed. Is the coyote wild game to be hunted and prized? Will it go the way of the buffalo and extinction floating in the sea of human memory and lore? Nature has become art. Will we take action and preserve and protect our environment and the living species in it? Will we reflect on shared necessities for survival? A place to live, eat, rest, play. A ‘pate de verre’, ‘paste of glass’, fish head looks like a prehistoric fossil. It is an object that is open for study, scrutiny and admiration. It is a relic of some former time. Will fish, now plentiful and a major food source, one day be extinct? Working in series and with repetition, a simple shift of materials and context produces profoundly different meaning. Using bronze gives a sense of permanence while glass and resin denote fragility. All are precious. Because a mold can be used many times, the sense of repetition and possibility play into the idea we have of the infinite capability of nature to reproduce. Each object is a reproduction while also being unique. My work draws connections between nature, the environment, culture, time and place. Artist Mary Chomenko Hinckley is a true materialist. Her work, constructed within an expansive mix of philosophical thought processes, is an honest accounting of the trials and triumphs of the materials with which they were made. Hinckley is a sculptor—but no more than she is a glass-worker or picture maker. She undertakes all three in equal measure, communicating the fuzzy delineations between an observational understanding of nature and its contrived counterparts. The feral spirit of animals is carefully and ironically juxtaposed against the playful sleekness of brightly colored resin. The representational nourishment of fruits and vegetables is upended and petrified in weighty bronze. Hinckley molds recognizable forms into those that mandate further consideration. The coyote is universally recognized as an ancient metaphor. It is a creature threatening for its precociousness, and the respect its paid is bound closely to its unpredictability. It is in this spirit that Hinckley repeatedly employs the coyote’s likeness. Coyote Rose and Portland Pink (2015), each present the untamed canine as a parodied re-imagining of its former self. The artist’s versions appear, static and tentatively-posed, as intruders in spaces where they’re typically unwelcome. Poised somewhere between inquisitive and something more sinister, their intentions await knowing. Matted fur and impenetrable stares are given further dimension by their semi-opaque materiality. While the viewer is caught in the animal’s sideways glance, they are unwittingly coerced into reciprocation. The gloss of the resin is slippery in both form and simile. Hinckley’s sculptures and busts are as paradoxical in their construction as the fairytale-like ethos of wild dogs. Hinckley has a similar interest in the spiritual cores of pigs and horses. Perfect Form (1992) is a bronze and nickel plated sculpture, appropriately sized for intimate introspection. The toy-like cast of a horse gallops along the perimeter of an ambiguous form. It is architectural—reminiscent of a golden age of Roman columns. The mighty construction, however, is crumbled and withered in a manner transformative to its value. Its broken ridges and marbled grain disguise it to the affect of a fractured tree stump. The mirrored surface below, and your reflection in it, complicate your thinking of each element. As as a sum, the work is a carefully composed proposition for a narrowly pre-apocalyptic future. The pre-existing boundaries of urban sprawl have dissolved, re-welcoming a wildness to slowly reclaim what it never should have forfeited. This reclamation is undoubtedly also an ideological one. Hinckley’s use of pigs is compelled by the backward conception of this particular animal as trope. “Pig” is commonly an insult. The notions they conjure are that of uncleanliness, excessive behavior and limited usefulness. Hinckley’s treatment, however, is the opposite to a confrontational degree. The pig is personified and admired for its curious and unexpected intelligence. The artist creates a sculptural connection between the pig and the tedious engineering of meaningful language. Signifiers of the communicative process are littered across a cast ground, taking the form of scrambled, bronze-coated letters. Selections from the Latin alphabet are dynamically scattered, giving heed to no completed words, but the potential for many. Pigs are the ideal metaphorical stand-ins for such hopefulness. Deconstructed language, much like animals of underestimated sentience, are continually on the precipice of possibility. Hinckley expands her exploration of boundary markers and undiscovered potentials through her appropriation of fences and gates. Inspired first by their repetitive ornamentation, and later their materiality, the artist serializes and abstracts their photographic image. Working frequently in prints on glass, the artist uses color and kaleidoscope-like compositions to reverse the object’s structural intention. What was once a clear statement about private space is now inviting, vigorously courting public attention. The artist conversely maintains representational clarity with works like London Gate (2013) and Verona Garden Gate (2013). The enamel infused photographs on glass are graphically impactful, and regard the spaces we are marginally excluded from as fantastical mirages. Whether the cost of entrance is valid, we can’t be sure. But, Hinckley’s masterful use of temptation certainly makes it seem so. The extravagance of image on glass is yet another well-suited marriage between meaning and material. Mary Chomenko Hinckley is a craftsman of the highest order. Her choices of materials have consistently poetic underpinnings. Even the most recognizable of images becomes adaptable under the weight of their unusual conception. The artist approaches the natural world with a perspective that’s simultaneously candid, pragmatic and artful. Her treatments of urbanity and domesticity are much the same. Photographs of decades of her children’s shoes are not simply a maternal preoccupation, but frank, observational research into the materials that bind us and the allure within their wear and tear. The public spaces within which we gather become appreciations of their parts—of the ways they were constructed and with what aims. The wildness we are occasionally privileged to encounter is situated firmly within the contexts and barriers we built to divide ourselves from it. Mary Chomenko Hinckley (b. 1951) is a sculptor, glass-worker and photographer with expertise in a broad range of materials. She has a been the recipient of degrees from Montclair State University, B.A., Montclair, N.J. and California College of the Arts, Oakland, CA, MFA, and attended Brighton College (Brighton, England) and the School of the Museum of Fine Arts Boston, (Boston, MA). She has exhibited throughout the west coast, including recent solo exhibitions at Augen Gallery (Portland, OR), and at Ruth Bachofner Gallery (Santa Monica, CA) and Haines Gallery (San Francisco, CA). 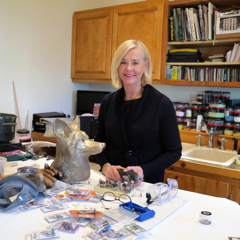 She has been selected for pubic commissions in San Francisco, Sausalito, Pasadena, and Los Angeles, California, among other locales. She is currently based in Portland, OR. Mary Chinckley discusses Gates of Venice–featured at the Augen Gallery–with KB00’s radio host Eva Lake. Click here to listen! Birds in Morocco & Geometry is a series of new work in glass that has developed out of my interest in creating both two and three-dimensional art. Monotypes, paintings, cast paper and bronze, and photography all have consistently been employed in making images and objects over the course of my studio life. Working in glass, a malleable material with an inherently rich color palette, provides me with an intriguing tangible medium in which nature and culture coexist. The transformation of glass through cutting, crushing, melting, and fusing, creates visual relationship within a new context that I find enthralling. Using a bird in each image sets up a thematic and compositional point of departure, a “grid” to work with and against. The biomorphic silhouette of the bird, indicating nature— the individual self, flight, freedom, escape, and wandering sets up a conversation visually, intellectually, and emotionally with its specific environment. The ellipses—beautiful geometric shapes— exist as planets circling the bird. The colors of the ellipses and stripes are derived from the bird’s coloration. In this field the image is transformed into a geometric, linear abstraction of the bird. Determining the interaction and relationship of the colors of the ellipses surrounding the bird are inspired by Josef Albers’ color studies. Each color behaves differently in a given environment. Ochre has an effect different in a white field than in a purple one. These conditional and shifting arrangements are vibrant and spatially charged. The bird put in relationship to a pattern taken from a tiled wall in Morocco raises questions of culture, architecture, and the use of design in everyday life within Islamic tradition. Having visited Morocco, Turkey, Syria, Egypt and Uzbekistan, I found the use of pattern to be ubiquitous. The idea of culture in the Moroccan pieces fuses with the idea of the individual; in my work the bird assumes the identity of culture by being juxtaposed with and derived from cultural patterns. The bird motif becomes the conveyer of ideas about the individual within a specific culture or society. Inspired by Ellsworth Kelly, the bird image placed in an abstract setting becomes a symbol of nature existing in a built environment shaped by human desire and endeavor. Here nature exists in a world , invented by a Master practitioner of abstract painting. The bird enters and inhabits the world of civilization, here represented by the human impulse to recreate and understand nature through pattern, shape, stripe, color—the basic tools of all art but most evident in non-representational modernism. In answer to that question, I would say that I make art to find questions and seek answers—and this process of inquiry is what underlies my practice and keeps it vital and intriguing for me. *Art historian Paul J. Karlstrom in conversation with the artist about her Birds in Morocco series, 20 February 2012. Drawn to metal gates and photographing them for years, I chose to focus on gates for a body of work in glass. The beauty and craftsmanship of gates is captivating. The notion of a gate is equally captivating. Questions arise; what is the function of a gate; keeping in-keeping out, utility-ornament, public-private, ownership: mine-yours. Taking a unit from a gate and re-purposing it to create a glass gate, I simplified the elements and used them as building blocks. Transformed from the original rust and black/grey metal the elements have become an instrument to work with color and its infinite relationships. Playing on colorists of the past, some pieces were informed by Josef Albers and his studies of color contrasts and optical illusions. “Purple/Gold Venice Gate”, “Venice Gate 2- Twilight” and “Venice Gate 2: Red/Green” are studies in color theory. Alexander Calder, and the power of a primary color palette is the inspiration for ”Blue Calder Gate”, “Calder Gate” and “Red Calder Gate”. Piet Mondrian’s musicality and energy created by line and color is the basis of “Venice Gate: Black on Boogie Woogie” and “Blue, Black, Gold Rods”. An earlier intrigue with Moroccan tiles has evolved into creating glass slabs where designs are assembled, cut and reassembled to form a new dialogue with color and patterns. The “Arc” pieces move the slabs into sculpture by becoming 3 dimensional. These pieces use color and lines to create an energetic dynamic. Painting on glass, a rich tradition in stained glass windows, has captivated me since childhood. Staring at painted figures and biblical scenes during boring church services in the Russian language, I was entertained and free to ponder while staring at the beautiful windows and light. In searching for a way to bring my photographs to glass, I found a solution in silks-screening enamel onto glass and kiln firing the piece to permanently bond the image to the glass. A similar process, using finely ground glass powder and screens, provides an alternate means of getting a photograph onto the glass. Glass powder rather than the liquid enamel is screened onto the glass and then fired. The resulting images have a time-stands-still, historical and romantic quality.